By early 1865, the Confederacy had its back against the wall. General Sherman and the Union army were taking large swathes of the south, marching through the Carolinas with relative ease. General Lee was desperately trying to protect the Confederacy’s capital of Richmond from the onslaught of General Ulysses S. Grant’s approaching forces. And he had to do it with extremely limited resources – and manpower. After much heated debate, it was clear to President Davis and his generals that the only source of desperately needed troops was the slave population. On March 13, 1865, a bill was passed by the Confederate Congress calling for a quota of slave-soldiers from each state. What did we go to war for, if not to protect our property? If slaves will make good soldiers, our whole theory of slavery is wrong. The Confederate government, however, rationalized that the Union forces would only free the slaves anyway, so they may as well use them to their own advantage beforehand. The Confederacy turning to slaves for recruits was even more questionable when you take into account that the Confederate president Jefferson Davis ordered that all black Union soldiers be enslaved or executed. And, indeed this is what happened. For instance, at the Battle of Fort Pillow on April 12, 1864, all black Union soldiers were massacred under Nathan Bedford Forrest’s command when they were trying to surrender. 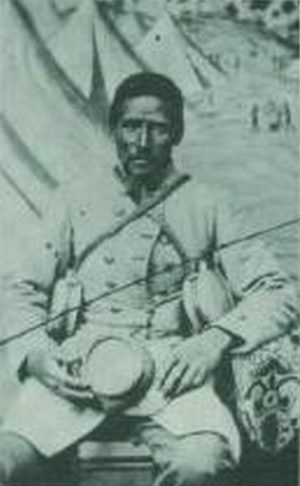 But now Jefferson Davis wanted black Confederated soldiers. Throughout the Confederacy, newspapers reported that thousands of slaves had enlisted. But in reality there was just a handful (probably around 50) of new soldiers. Only two units were formed, both in Richmond, both heavily guarded by military police. They received very little training, were without uniforms and rifles, and were spit on when walking down the street.